Liew (first from right) pictured during the public mobile service programme at Terminal Batu Sapi on Sunday. KOTA KINABALU: Parti Warisan Sabah led-government does not rule out the possibility of individuals from the opposition arranging illegal immigrants to pretend seeking assistance in getting MyKads, said De facto Law Minister Datuk Liew Vui Keong. He said this is part of the opposition leaders’ dirty tactic in winning back the rakyat’s support as they had ran out of ideas due to their lost in the last general election. “Warisan is never involved in helping illegal immigrants to get MyKads. We only organised a public mobile service programme whereby we would go down the ground to meet the people and attend to their grouses including lack of basic amenities,” he explained. “The public mobile service programme should not be politicised. It is not a new thing as it had been organised by the previous government as well,” he said, adding that the current opposition leaders had used this as their ploy to paint the current Warisan government in the bad light. 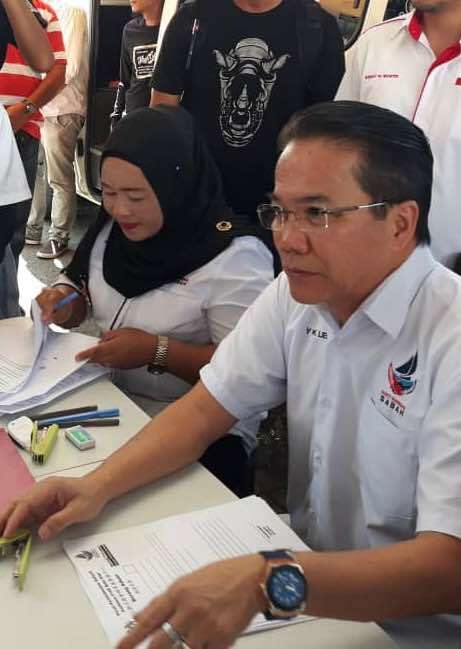 “I believe the MyKad issue which had gone viral on the internet is the work of the opposition,” he said when asked to comment by the media on the recent public mobile service programme held at Terminal Batu Sapi on Sunday. Liew also said there had been individuals who had come forward with letters for various applications with identical format and font throughout the three mobile service programmes they conducted after he won the Batu Sapi Parliamentary. “I decided to enquire where they got the letters done as I was curious due to the fact that many of them are illiterate,” he said. “I was shocked to learn that they had their letters done in the town centre and they paid certain people to do the typing by paying anything from RM10 to RM100 for a simple letter or just to fill certain forms. “I am very disturbed by this and had instructed my staff to investigate and lodge police reports against them, if necessary,” said Liew. Liew said the public mobile service programme, which was done at various places in his constituency was to get the people closer to him, as their representative, without having to come to his office. “It’s one way of getting rid of the formality and bureaucracy that hinder people from getting services from the various agencies,” he said. Liew went on saying that they found that there are many people who are still not aware of their citizenship application status despite being granted permanent residence or red identity cards as it is known. This is where we will assist the people from enquiring from the relevant department on their status, he explained. “I remember a case where a man, in his late 70s, came and asked me why was his application for citizenship took more than 20 years and still has no news from the government. “I asked him to produce the letter written to him and the letter in fact, was just asking him to produce his late parents’ documents, which he had kept all these years but because he is illiterate and so were most of his children, he obviously did not know what to do,” he said. “I took his case and went to the government department and in less than a month, he got his citizenship done,” he said, adding that this is just one of the cases where lots of the people, who being illiterate faced all kinds of disadvantages if they were not to be helped. Liew further commented that of course news travel fast, and some people had mistakenly thought that he could approve citizenship which is not true. “I cannot really blame some of the locals and other migrants for thinking like that as some of them are illiterate and have no proper educational backgrounds. “Some of them have lived in the country for a very long time in the hope that they can get some forms of recognition from the government,” he said, adding that it could be a dicey situation for the government but they must address the issue regardless they like it or not. Liew said the most unfortunate development arising from the public mobile service programme was that there had been unscrupulous people who would manipulate the situation while at the same time milk the poor people by asking them to pay for their services which they did not provide. “I was told by my staff that when he went to a shop in Sandakan, he saw a notice inside the shop counter that say in essence that he is helping me, as MP for Batu Sapi, to provide type writing services to the people. He charges a fee but when my staff wanted to inquire more, and upon recognising him, he quickly took down the notice and destroyed it,” he added. As such, he urged the people not to be easily swayed or hookwinked by the opposition propaganda. Liew also refuted the claim made by Tawau Umno youth chief Ghazalie Ansing on Daily Express news dated Sept 11, stating that Warisan had organised “political motivated” programmes in schools involving matters related to citizenship. “This is not true. In fact, a police report had been lodged against those involved in putting up the banner about a ‘Program Khidmat Rakyat’ organised by Warisan at SMK Titingan,” he said. Earlier, a photo of the banner stating Parti Warisan Sabah’s former candidate for Apas, Abdul Salip Ejal offering to assist Warisan in matters pertaining to identification documents had gone viral on social media. Abdul Salip denied putting up the banner and claimed that it was the work of irresponsible quarters with the intention of tarnishing his name and the image of Warisan.